It seems that entrepreneurs, marketers, influencers and new bloggers are using webinars to help them grow not only their traffic, but also their email list. So, it’s no wonder that webinars have exploded this year. In fact, it’s predicted that 3/4 of all web traffic will be video by 2017. Well, for starters, people’s attention span is shorter than a goldfish – 8 seconds, which is down from 12 seconds. It seems reading an entire blog post, word-for-word, is now reserved for editors. The typical user online only scans the post, picking out bold phrases and subheadings. But with a webinar, you’re using more than your vision. You consume a webinar much more efficiently because you’re listening, taking notes and seeing slides that reinforce what you’re hearing. Video content also has enormous potential reach. YouTube receives over 1 billion unique visitors every month. Since Google has recently moved webinars from Hangouts on Air to YouTube Live, it’s easier than ever to tap into a wider audience by making your webinars public. Finally, webinars are becoming more and more popular with solopreneurs and small business owners because you can get started for free using YouTube Live. With just some earphones, a built-in microphone and a slide presentation tool like PowerPoint, Keynote or Google Slides, doing webinars to grow your email list is a budget-friendly strategy. Webinars do so much more than grow your email list. The biggest advantage is that you can really connect with your subscribers. They get to hear you, see you and interact with you during the webinar in the chat. It’s much more personal than just reading a blog post. Let’s get real here – with a webinar, you’re showing your personality and your ability to teach what you blog about. Most webinars have a Q&A section where the host answers questions on the spot. Answering anything that’s thrown at you helps build your credibility as an expert in your niche. For example, Melyssa Griffin is seen as a Pinterest and marketing expert partly from the webinars she offers for free. It’s common knowledge that owners of marketing blogs host a lot of webinars. But, imagine hosting a webinar in a new niche. You can be that blogger who starts doing webinars in your niche before anyone else. This immediately makes you stand out and helps you become a leader in your niche. For example, in the freelance writing niche, I haven’t noticed many freelance bloggers doing webinars. 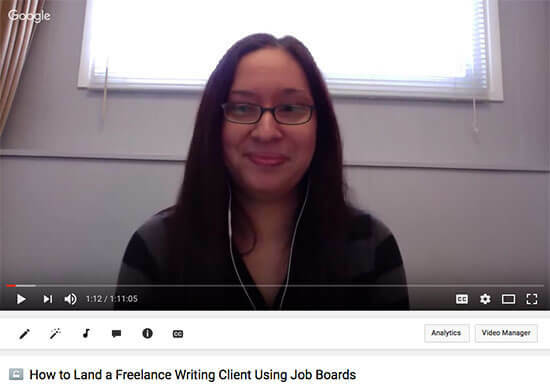 I was able to stand out last year by hosting a webinar for freelance writers. I’ve since done webinars for my other blog and will start doing more freelance writing webinars for my main blog as a way to stand out in my niche. 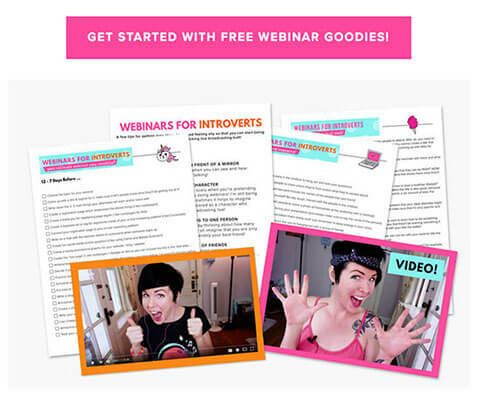 It’s no secret that you can generate some serious money hosting webinars. How? You can monetize your webinar by offering products or services. A popular strategy is to bundle them up and offer them at a discount. Clément Delangue of Mention made $10k in his first webinar, and Amy Porterfield regularly makes 6 figures during her webinars. But, you don’t have to be an influencer to profit from your webinar. New bloggers can profit too. I was able to sell my freelance writing course during and after my webinar, and it proved to be a strong marketing strategy. Now that we’ve covered all the benefits of doing webinars, let’s look at how you can use webinars to grow your email list. One of the easiest ways for new bloggers to quickly grow their email list is to host a webinar. 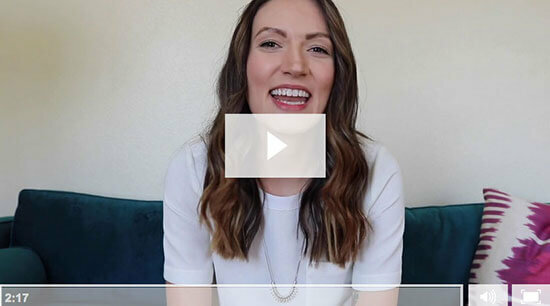 Mariah Coz generated 600 new subscribers in 48 hours when she promoted one of her webinars. Over on my Twins Mommy blog, my first webinar generated 370 new subscribers and my second webinar helped me reach over 1.2k subscribers – and my blog was only 4 months old at the time. Here are five ways you can strategically use webinars to grow your email list. You made a webinar and now it’s time to promote it. The easiest way to do this is to talk about it in your next blog post. This tells new visitors to your site what you’re doing and it gives you a way to promote your webinar on social media – instead of directing everyone to your landing page. Your blog post can go more in-depth than your sign up page about why you’re doing a webinar and what exactly the webinar is about. Helene, of Helene In Between, wrote a blog post that talks about a problem most bloggers have – generating traffic. She then announces that she has a solution to generating more traffic – in her free webinar! Just make sure to add, “Free webinar,” to the title of your blog post as a way to entice people to click on your link. Not only can you market your webinar as a live event to grow your list, but you can also use the recording as a lead magnet for your blog. Brie Beeks of Blissful Bosses offers a webinar as one of her lead magnets. 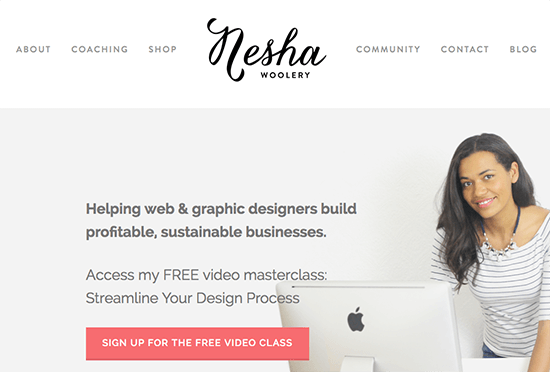 Nesha Woolery is using her recent live workshop as her lead magnet to help grow her email list, and also to introduce people to her latest course on organizing. And if you’ve ever wondered what to do with all those webinar recordings and content upgrades you’ve created, you can open a resource library to house those valuable freebies and turn it into your lead magnet. You can also add opt-in forms like popups to your blog to promote your webinar. This is especially easy if you use WordPress. Learn more in our post on popup plugins for WordPress. These can get a bit annoying when overdone, so consider using exit-intent popups that only display as someone is about to leave the page. Or opt for a slide-in style form instead. Using content upgrades is one of the most effective ways to grow a targeted email list. 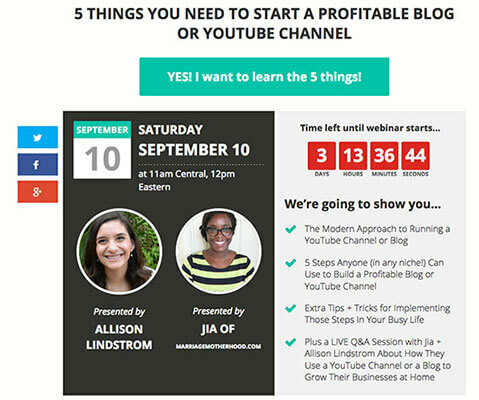 Imagine combining that with the powerful list building tactic that is the webinar? Readers are already hooked reading your amazing blog post, so when they find out that you also have an in-depth webinar about the same topic, they will be more likely to opt-in to your list. For example, Allison of Wonderlass has a blog post about the 10 reasons you should start doing webinars. In that post, she has a content upgrade bundle of worksheets, checklists and webinar recordings about doing webinars. This is a great way to repurpose your recorded webinars and grow your email list in the process. A joint webinar is a webinar that’s hosted by two business owners where one or both make an offer, or pitch, at the end of the webinar. You don’t have to pitch during a joint webinar if neither of you have products or services to offer. In this case, the joint webinar is purely a list building tactic, and a very effective one. Typically, one blogger invites the other blogger as a guest to share their knowledge. The “guest” blogger introduces their message and product or service to a warm audience. One of the reasons for collaborating with another blogger on a webinar is to share email lists. If you end up collaborating with someone who has a much bigger list than you, there’s the potential to grow your list dramatically. 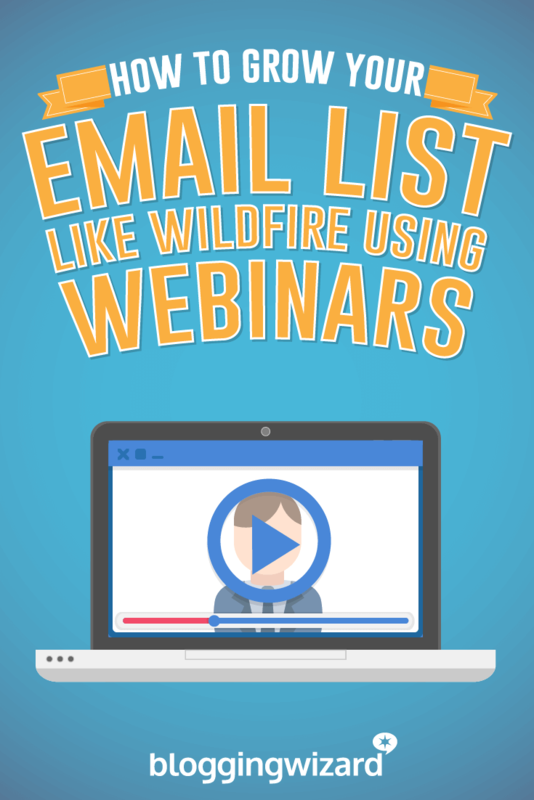 How do you easily share email lists when promoting a joint webinar? 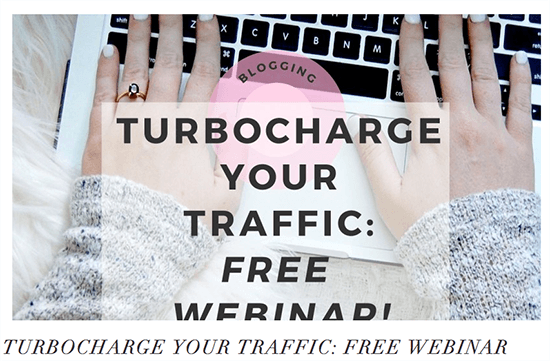 By having each blogger set up their own webinar sign up landing page. For example, if I was doing a webinar with Adam Connell, I would promote his sign up page to my audience and he would promote my sign up page to his audience. By doing this you are expanding your brand to a new, untapped audience and in the process, growing your email list like crazy. It’s been proven time and again that people seek others to confirm their beliefs. It eases their minds when they see that others have bought a particular course or exchanged their email for a freebie. This is called social proof and it’s a powerful way to increase your conversions on your webinar sign up page. Just think about your social sharing buttons. Do you display the number of shares? For your readers, a high social share count indicates the post is popular and informative. So, when you see a post with a high number of social shares, you’re more likely to stop and read the post, right? 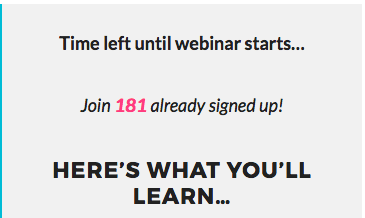 Well, wouldn’t it be neat if you could do that on your webinar sign up page? I decided to try this out for my Pinterest Perfection webinar to see if I could generate a lot of sign ups. In the end, I had over 200 people sign up to my webinar – in a new niche with a brand new blog. Most email service providers should have a fairly easy way to retrieve your current subscriber count. For example, if you have a WordPress blog and are using MailChimp to deliver your emails, you can use the MailChimp Subscriber Chiclet plugin on your sign up page to display your list size. And if you’re using AWeber, you just add some HTML code to show a counter on your page. Webinars are becoming more popular with bloggers since video is becoming the mainstream medium to consume content. And with the budget-friendly option of YouTube Live, even new bloggers can start hosting webinars. While there are many benefits to hosting webinars, like increasing traffic and credibility, many bloggers, entrepreneurs and marketers use webinars as a list building strategy. By promoting your webinar on your blog and as a lead magnet you can capture new visitors to your blog. 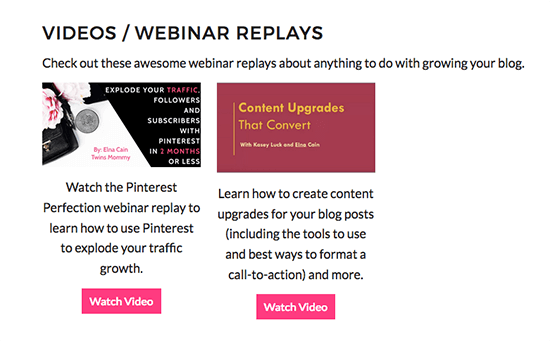 You can also use the recording to grow your email list by having a sign up page to access the replay. Finally, using social proof can motivate new visitors to register for your webinar and potentially help you gain hundreds of additional subscribers. Just be sure you have a full sales funnel setup around your webinar – even if it’s a basic one.